As soon as I arrived in Paris a few years ago, I quickly found myself enraptured not only by the beauty of the city, but by the depth of history that is always present, sometimes obscured by modernity, but always just beneath the surface. My husband has pointed out on several occasions that when we come across an old building or monument, he is struck by its form, its colors, and its beauty, but I am struck by a sense of wonder at what happened there, to whom, and why. I knew that I had some French ancestors in my family tree (although they were very, very deep in the roots), so it’s no surprise that I soon started to wonder about my genealogical connection to France, however attenuated it might be. I knew from Aunt Adeline that I was descended from the Joseys who — according to at least one account — were Huguenots (French Protestants) who emigrated in the 1500s to Scotland. There, they anglicized their name before eventually emigrating to Virginia in the mid-1600s. So, I decided to delve into my old genealogical records and do some heavy-duty research on ancestry.com to track down the first French Josey. Unfortunately, it didn’t go as well as I had hoped. I ended up tracing the family back to Virginia in the 1600s, to London in the 1500s, and to Scotland in the 1400s. There were Josseys, and Jossys, and even Jowseys, but the French connection remained elusive, and the Huguenot story seemed to fade under the light of my desk lamp. It seemed that I had reached a dead-end. Peter’s father, Andrew Dubose, was born in 1699 in Jamestown, Carolina (also known as St. James Santee or “French Santee” because of the large number of French settlers in the area) and was the first of my French ancestors born on American soil. Andrew’s parents, both of whom were Huguenots, had emigrated from France because of religious persecution there. Andrew’s father, Isaac Dubosc, was from Dieppe in Normandy and immigrated to Carolina between 1685 and 1687, probably by way of London where it appears he had immigrated by 1682. 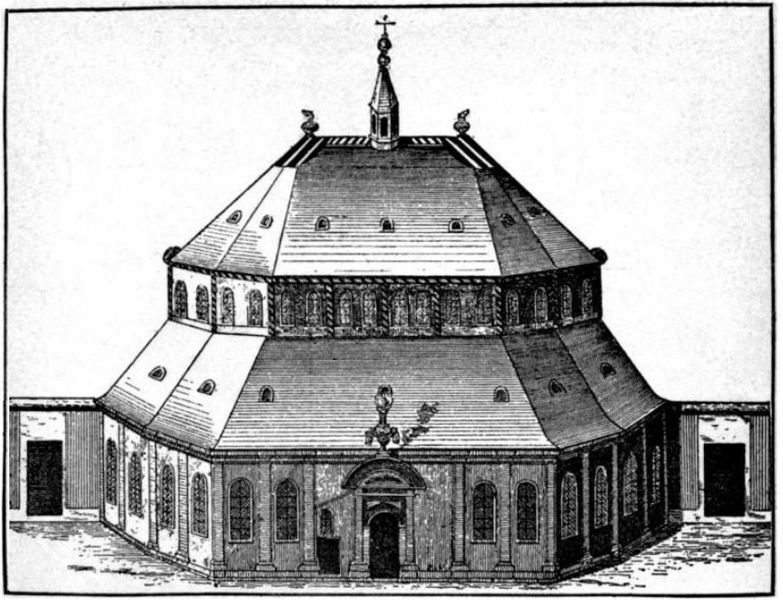 (There is a record of his giving testimony at the Threadneedle Street church in London on August 23, 1682.) Isaac’s wife, Susanne Couillandeau, was born in La Tremblade in the region just north of Bordeaux known as Poitou-Charente. Conflicting sources raise questions about whether Susanne immigrated separately from Isaac, or if she, too, immigrated first to London before going on to Carolina with him. It does appear that her mother Marie Fougeraut was in London and was a widow (perhaps for the third time?! ), before she immigrated to Carolina. In any case, Isaac, Susanne, Marie, and Susanne’s brother Pierre appear on a “List of French and Swiss Refugees in the Province of Carolina who wished to be Naturalised English,” a document prepared in 1695/1696 from the passenger manifests of various ships arriving in Charles Towne at that time. The South Carolina archives include a 1691 deed she signed along with her son Peter (Pierre) Couillandeau, her son-in-law Isaac Dubosq (sic), and his wife and her daughter Susana Dubosq (sic). Dubosc’s name was later transcribed in The Royal Land Grants book, now archived in Columbia, as both “Isaac DuBosek” and “Isaac Dubose,” hence the several variations of the original name used at different times even by the same person. According to some records, Isaac and Susanne were married in French Santee in 1688 and had ten children, of which Andrew was the sixth. Other records indicate that they married as early as 1680 (either in France or in England). A list of Huguenot settlers at Santee in the Carolina colony. 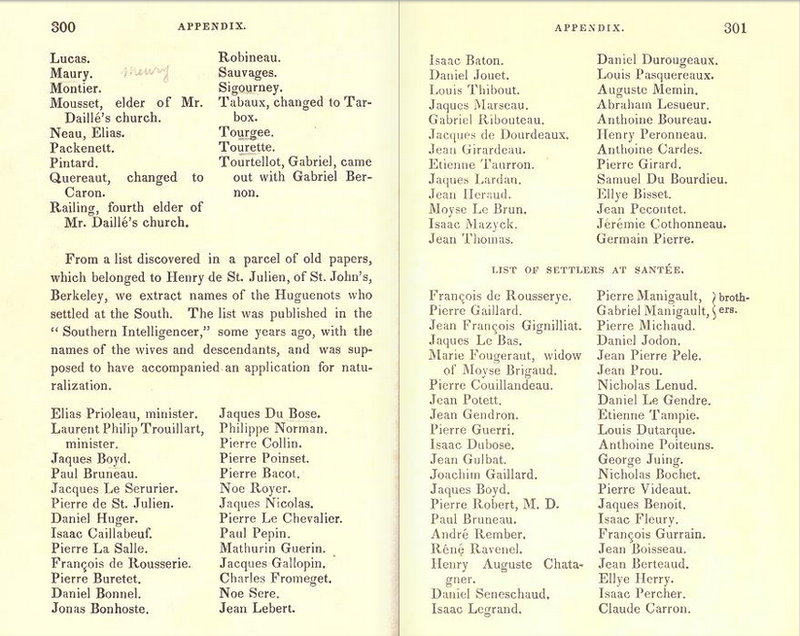 In the first column you can see my 7th great-grandfather, Isaac Dubose, my 8th great-grandmother (his mother-in-law), Marie Fougeraut, and her son, Isaac’s brother-in-law, Pierre Couillandeau. Source: Lee, Hannah Farnham Sawyer. The Huguenots in France and America. Cambridge: John Owen, 1843. Here you see the continuation of the list of settlers, including Benjamin Marion, who was the grandfather of the “Swamp Fox,” General Francis Marion, under whom my 5th great-grandfather, Peter DuBose, fought as a captain during the American Revolution. This is an interesting discovery for me, because it shows that the grandparents of both Francis Marion and my ancestor, Peter DuBose, were from the same Huguenot settlement. Source: Lee, Hannah Farnham Sawyer. The Huguenots in France and America. Cambridge: John Owen, 1843. The period during which my French ancestors came to America was one of relatively heavy Huguenot emigration, not only to America (particularly Carolina), but to England, Holland, Germany, Switzerland, and the Dutch colonies in South Africa as well. Despite the Edict of Nantes, which King Henry IV issued in 1598 to end the religious wars in France by granting limited freedom of religion to Protestants, the position of Huguenots fluctuated continuously according to the tides of domestic politics and France’s foreign relations with neighboring Protestant powers. During the reign of Henry’s son Louis XIII, and especially after his son Louis XIV acceded to the throne, persecution of Protestants increased significantly. Despite du Bosc’s eloquence that day and the esteem in which the King subsequently held him, the situation continued to deteriorate over time. Ultimately, the King revoked the Edict of Nantes in 1685, and Protestantism was once again illegal in France. The wars of religion were not reignited but, as du Bosc had predicted, the floodgates of emigration were opened, and the trickle of immigration that included my ancestors Isaac and Susanne turned into a veritable exodus in which at least 400,000 Huguenots fled the country. So there you have the story of my French connection … how perhaps the last of my purely French ancestors was also one of my first ancestors born in America. Having a sixth great grandfather (my grandfather’s grandfather’s grandmother’s grandfather) who was French makes me just 1/256 French, but at least it’s nice to know where that 0.4% comes from! * The name DuBose is generally said to derive from the French “du bois” meaning “from the woods.” The name “Dubosc” or “du Bosc” derives from the Norman dialect for the same expression. ← Vive la France … à Adams Morgan! Thank you. The information you shared is with style and meaning. In the lower branches, or amongst leaves and twigs under the family tree, perhaps there might be a trace of me. Recently, just outside Opp, AL, some maintenance was necessary to the grave of my grandfather, Hillary Hubbard DuBose, which is located alongside the grave of his father, CSA Pvt. Jeptha DuBose. The occasion was intriguing and stirring. So happy you enjoyed the post! I have always been a fan of history (including family history), so it’s always a treat when the two nicely coincide. During my next trip to Bishopville, I think I’ll contact the owner of this tract of land to see if I can arrange a visit to the gravesite of Capt. DuBose. What a treat that would be. Enjoyed the article! But I have prove of my relationship to Captain Peter DuBose. Put 5 in front of grandfather from Middleton DuBose, his son. i lice in Sumter, SC and I know where the grave is and I have had problems finding out who the owner of the property is now. I do know it is rented out for farming. Would love to compare history. Thanks for the message, Jean. It’s great to hear from another descendant. I’m descended from Captain DuBose through his daughter Elaine, who married Asa Woodham. Their daughter Pheriba married James Simpson Skinner, my great-great-great grandfather. Their son, William James Worth Skinner was the father of Henry Lee Skinner, who was the father of my grandfather, Willard Buddin Skinner. Do you know my mom, by any chance? Frances Skinner Bell? I don’t know if you have family in Lee County, but we know lots of McCaskills, and my mom used to teach in Sumter at LcLauren High School. My line starts with Middleton DuBose, Peter’s son. His daughter Frances married Robert Scarborough and one of their sons Middleton, married Lousia Carter and thus my grandmother Willie Mary Scarborough married Charles Beasley and my mother came along Betty Jean and married my Dad O.D. McCaskill, I also am on the line of Middleton DuBose youngest daughter Edwina who marrried James A Beasley, their son Lucius married Geneva Nichols, whose son Charles married Willie Mary Scarborough. I am double kin to myself. The McCaskills that I am mostly kin to live in Kershaw county. I went to McLaurin when I was in 7th-9th grades. My grandparents Charles and Willie Mary lived in Bishopville. They are buried at Bethlehem Cemetary in Bishopville as well as a lot of DuBoses. Did your mom used to live over behind Davis Street in Bishopville and teach Home EC? That’s her! Apparently she used to ride the bus to school with your mother and knows your family. Small world! Very cool that you found my article since we’re apparently distant cousins! Yeah!!!!! She was my Home Ec teacher, and she went to school with my mother. Never knew though that we were related. Small world when youstart looking at family history. And I am glad that I found your article. I am a descendent of Isaac’ DuBose’s son, John, and live in Sumter County, South Carolina. 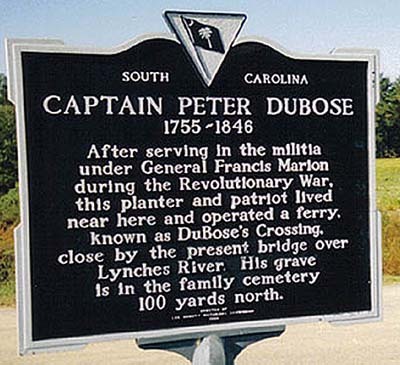 The grave of Captain Peter DuBose is in a small cemetery that is very close to the highway and an short walk through planted fields. Well, hello distant cousin! Thanks for the post. Yes, we drive past the historical marker on Hwy. 15 just before Lynches River very often. I will be back in South Carolina in September and I want to make plans to see the family cemetery. Having been there before, do you think I should contact the owner of the land beforehand? I don’t want to make anyone mad by tramping through his fields. Would you contact me privately? I have several important points I’d like to discuss with you concerning Isaac & Suzanne (Couillandeau) DuBose and her mother, Marie. That would be great! Can you send me a message at jeparleamericain@gmail.com? Greetings. Nice blog. I was always curious about the different spelling (DuBosc) and you’ve explained it. I, too, an descended from Isaac and Suzanne. I must say I’m quite curious regarding Anita’s post mentioning them. If possible, could you email me as well, Anita? My email is cdubose09@gmail.com. Thank you! I will be sending this to my brother who is obsessed with our DuBose family history. My name is john dubose descedant of the same isaac and susanne dubose. It is always a joy to read anything written about the family. Most of the public record information and some that is not has been apart of my evryday life since i was a child taking in the services at the huguenot church in cha as i dorleston as my father was a geneaoligist for our family. If you love history as i do then our family history a rich one. I urge you to do as much digging and learning as possible into the lives of these ancestors and other family branches. Thank you for your interest and your post. Thanks for your comment, John. This has truly been a great experience for me. Thanks to Isaac and Susanne, I’ve finally joined the Huguenot Society of SC. I’ve written a few more articles on the blog about that process. Again, thanks for the comment and for visiting the blog! Take care, “cousin”! Laurence, you are descended from Isaac & Suzanne’s son Isaac DuBose & Madelaine Rembert. I have your lineage, also, David R. DuBose (on DuBose Forum on Facebook) is in your line. I am trying to help a man named Frank Dubose put his coat of arms on something large like a blanket as he is going blind. The image on your page is very similar to the tracing he gave me to show what his coat of arms is. Could you possibly direct me to a place where I could get rights to the image to use for the purpose of enlarging it for him? He has traced his family back to the 13th century, so I don’t want to direct him to a different coat of arms like I am finding on the commercial websites. Thanks! Well hey there cousin. I am also a Dubose. My line was from Peter and then to John Franklin married Tina Elta who are my great grandparents. Cool find thanks for the info. I too am a direct decendant of Andrew DuBose. Pleased to meet you all, love and peace be with you and your famlies. Great conversation! I am pleased to find more cousins and learn from each! I am preparing for my first trip to France and found this while exploring my DuBose history. I too and from the line of Issac and Susanne! My name is Marianne and I, too, am a fifth great granddaughter of the Dubose. Just discovered that I, too, am a descendant through John. I realized that the only thing I knew about the word “Huguenot” was that it was French. To my surprise, I have French ancestors. Thanks for sharing your work. Hi cousin! We’re pretty numerous, it seems! Our ancestors have a very interesting story, don’t they? I am also a direct descendant of Isaac DuBosc (DuBose) and Suzanne Couillandeau. Then, my line descends from their son, John DuBose, and then through John’s daughter, Martha DuBose who married John Warren. That group ended up in the Jackson/Brandon, Mississippi area for many generations, and my mother was born and raised there, too. Like you, I have also submitted my application to the “South Carolina Huguenot Society”, and I have received a nice email from their genealogist who says she is working on my line now. I find genealogy fascinating, and my Huguenot line is one of my most interesting. 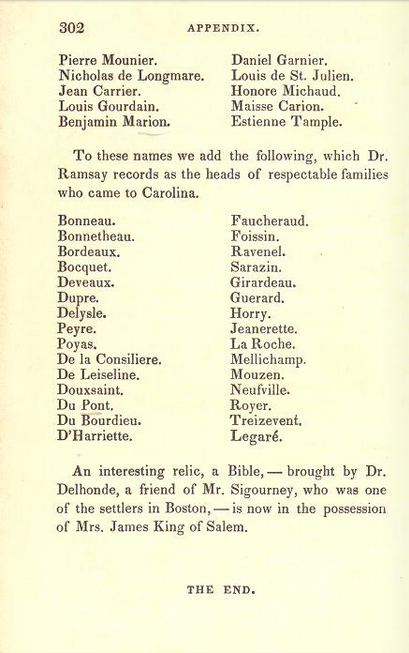 The “South Carolina Huguenot Society” has a Word doc of acceptable surnames. After downloading their list, and comparing it to my family tree, I have at least four other Huguenot names from which I descend. I believe they married into the other Huguenot families often. One of my Huguenot lines is also from my father’s line. The last name is “Beauford/Beaufort”. Check your family trees closely. Also in my father’s line, I am a direct descendant of the Fuqua/Fouquet family, but they settle in Virginia, not South Carolina. Virginia also has a Huguenot Society, but the South Carolina group interested me more… probably because I love Charleston, and they have the oldest Huguenot Church in the country. Well, nice meeting all of the cousins, and cross your fingers for me. I hope I don’t have to produce a lot of info for my Huguenot membership! My line: DuBosc (DuBose), Warren, Warren, Warren, Ball, Lewis, Lewis, Spann, Branum. Very interesting! Thanks for sharing with me, Susan. It’s always a real pleasure to connect with my distant cousins. The descendants of Isaac and Suzanne are indeed many! Good luck with your membership application, but I’m sure it’ll be approved with no problem. The staff at the Society are very helpful folks.